Russian President Vladimir Putin has signed a huge gas supply contract with China during his visit to the Asian country. The deal between Russia’s Gazprom and China National Petroleum Corp (CNPC) has been 10 years in the making. No official price has been given but it estimated to be worth over $400 billion. Russia has been keen to find an alternative energy market for its gas as it faces the possibility of European sanctions over the crisis in Ukraine. Shares in Gazprom rose 2% on the Russian market following the news. The agreement is expected to deliver some 38 billion cubic meters of natural gas a year eastward to China’s burgeoning economy, starting around 2018. The main argument has been over price and China is thought to have been driving a hard bargain. Over the last ten years it has found other gas suppliers. Turkmenistan is now China’s largest foreign gas supplier, and last year it started importing piped natural gas from Myanmar. Another sticking point has been the construction of pipelines into China. Currently there is one complete pipeline that runs across Russia’s Far East to the Chinese border, called “The Power of Siberia”. The pipeline was started in 2007, three years after Gazprom and CNPC signed their initial agreement in 2004.
Financing the $22-30 billion cost of sending it into China has been central to the latest discussions. 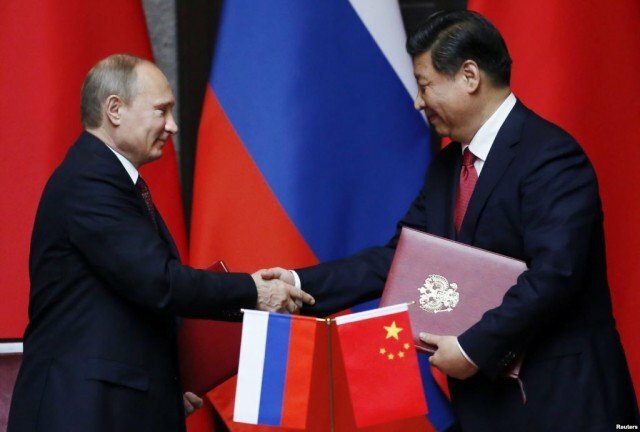 China is Russia’s largest single trading partner, with bilateral trade flows of $90 billion in 2013. China and Russia aim to double the volume to $200 billion in 10 years.